Hopefully, the first of many sets! Has anybody seen them in the flesh? How big are they really? Well they say 54 mm, but I do understand your doubts. Why are they so expensive? The Call To Arms French Line Infantry are also plastic, also 54mm, better sculpted, have the bayonet scabbard in the correct position and you get 16 of them to a box for perhaps £8.00 GBP including delivery, which is about a fifth of the price. EDIT: Aha, these are Singapore dollars, not US. So $32.50 USD Sing dollars delivered is about £18.60 GBP. When postage is considered they are not so far off piste I guess. Double rather than 5x the price. Dumb question. What is wrong with the bayonet scabbard position? For centre companies, they do show on the right hip, with a single cross belt. OK, one figure has a sabre-Briquet, I assume an NCO. I thought that was right, but am no expert on French infantry uniforms. Happy to learn! In all the sources I have the bayonet is attached to the crossbelt higher up and lies along it. Here it is fixed to the belt by the cartridge box, which is too low, and hangs down the right leg. In this Call To Arms lineup, you can see where the bayonet is on the three figures on the right, which is the correct place, I would say. No, these are $32.00 USD US. Blimey. 5x the going rate! 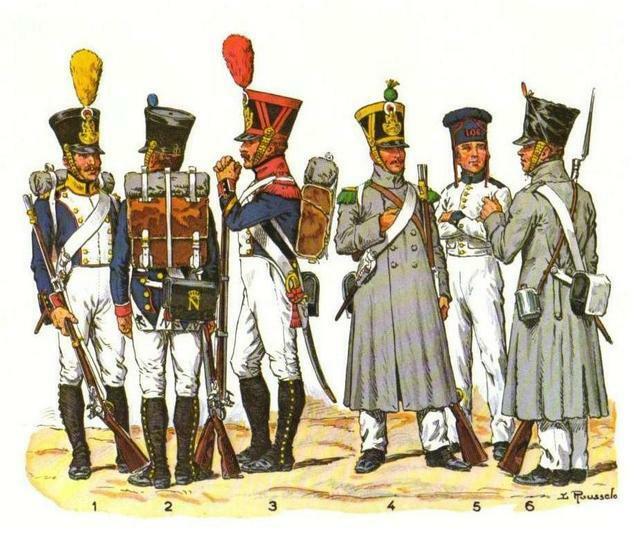 The bayonet placings…I always imagined like the "British"…but opposite side and low on the hip. I can find loads of references for that…but again would stress that I would not know a Voltigeur from a Carabinier! So apologies if I am totally wrong and to the many who could not "frankly give a damn my dear". I truly want to learn. most likley the scabbards on the model are placed as they are due to casting possibilities. As usual with a lot of soft plastic figures very nice anatomy but lack of research and therefore detail. The figures I posted and the pictures you posted broadly agree. The 54mm figures in the OP do not – they show the bayonet fixed at the waist and lying along the leg down to the knee. For 5x the going rate they should be more accurate IMHO. Just found this thread. The figures are 54mm – not 60mm like the medieval and WW2 ranges. As for the price, you get what you pay for. Not cheap and cheerful like HaT or ACTA, but high quality figures that once painted are almost impossible to distinguish from metal "collectors' quality" figures. As for the bayonets, either ACTA are wrong or the exhibits of actual Napoleonic uniforms in the Invalides in Paris or the Musee de l'Emperi are wrong. Having seen those actual period uniforms, I'm with von Winterfeldt on this one. The ACTA sculptor was told to put bayonet scabbards on the front somewhere and did just that!